Happy Father’s Day – We’re 15! It’s been a while. Sorry. First off, lets have a very warm round of applause for Mr. Simon Windmill, Mr. Cary Woodham, and every reader reviewer. I’ve been near, watching, reading, and liking but… Let me explain. The party deduction game, Codenames, continues to be wildly popular: spinning off a Pictures version, a two-player Duet version, and now USAopoly has licensed to to create a Marvel and a Disney Family edition. Rather than giving clues and guessing words, the new editions come with cards containing full color art of the two different themes. While Marvel serves as a fun version for fans of the comics and movies, the Disney Family Edition makes the game even more accessible to the younger set and is worth a look for families of even younger grade school children. DropMix makes a game out of the role of a DJ. Players drop music track cards into slots on the board, mixing their sounds together to make new remixes of their own. Players compete or cooperate while playing a matching game to create new sound mixes. While the game doesn’t have much depth, the fun in the system lies with messing around with different combinations of the available tracks. 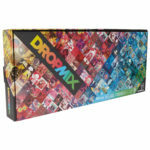 As a game, DropMix is so-so, but for music fans it can be a fun and interesting toy. Zendo reminds me of a twist on the great game of Mastermind, where a player would guess a solution by getting minimal feedback on successive guesses. Zendo uses plastic pieces arranged according to a secret rule, and then multiple players build structures in an attempt to figure out that overarching rule. The result is a great little deduction game that I even use to teach my students inductive reasoning in class. Happy Holidays! Boardgaming has had a serious upsurge in the past few years, and there’s no better time to get into the hobby than an extended holiday break. As we at GamerDad have done for the past 15+ years, it’s time for an annual rundown of recent boardgames well worth your time. Nothing beats the social aspect of in-person gaming with friends. Last year’s run-down is a great list of recommended games. Here again are some great examples of boardgames to get you and your family gaming. You might not find all these titles at your local mega-mart but many can be found online or in a friendly local game store. Some may argue $50+ boardgames are expensive, but compare that to videogaming (and where multiple copies are required for multiplayer play) and the economics of boardgaming shows their true value. Good boardgames are timeless, just as good today as they will be years in the future. They will provide many more hours of entertainment than most video games. In that vein, feel free to delve into some past year’s guides for 2015, 2014 , 2013 , or 2012. Role-playing games are typically a theater of the mind, but sometimes setting up a fancy game area makes an encounter extra special. Plaster or resin terrain can be used to set up a dungeon or castle, but they aren’t cheap, about $1.50 per piece. However, if you have access to a 3D printer, you can print your own for about ¼ the price. While some 3D files can be found at the popular Thingiverse site, Fat Dragon Games (currently running a Kickstarter) sells a selection of files for printing professionally sculpted 3D terrain pieces. The party game has evolved from the days of Charades and Trivial Pursuit. Here are a pair of games from Hasbro that are less “game” and more “party”, but should supply plenty of laughter. Speak Out has players trying to pronounce words while their lips are spread apart, and Pour Taste simply challenges players to drink from a cup full of a little bit of everything. It is easy to argue that the Nintendo Gameboy revolutionized the portable gaming market, and may even have created the market. Since that time, Nintendo has found the Gameboy system to be a reliable source of income, updating the system and churning out games at a regular pace. For the past six years, the system of choice has been the Nintendo 3DS line. (Note that the “Gameboy” moniker is no longer present.) However, calling it the 3DS line of hardware does not do the variability of options justice. In celebration of the newest release, the Nintendo 2DS XL, I thought it might be fun to take a look back at the history of the handheld and possibly offer some advice.. Escape Rooms have been growing in popularity and fans now have a way to have a similar experience in their own home. Several companies have released an “Escape Room in a Box” style game that provides an Escape Room experience through a consumable game. (As you play, the components are destroyed.) Just this week, Exit: The Boardgame, was honored as one of the two “Games of the Year” in Germany. Today we’ll take a look (without spoilers) at one of the Escape Room options, Exit: The Game.